Theatrical costumes can be a mix of custom-made and off-the-rack items. Often stuff can be specially made at great expense for leading players in one production, then put into storage for many years before resurfacing to cheaply clothe supporting or background actors in something else. 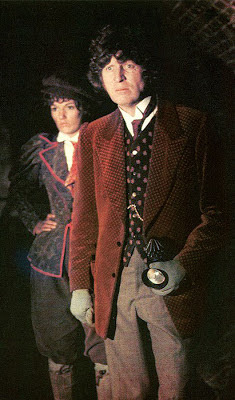 Although there is no doubt The Doctor’s frock coats were custom-made (one for Tom Baker and a copy for the stunt double) it is quite possible the various tweed trousers and Victorian shirts were simply found from Angel’s vast archive of stock. Another such combination of item could be parts of his Victorian sleuthing outfit from The Talons Of Weng-Chiang. I was watching a vintage episode of Miss Marple - not the recent travesty starring Geradine McEwen or Julia McKenzie, but the classic episodes with Joan Hickson. While watching 4.50 From Paddington, I noticed one of the lead players was wearing a dark rust-red velvet jacket (see left, top). Single-brearted, it has revered lapels (see left, second picture) and a distinctive polka-dot design (see left, third picture). There is no question in my mind it is the jacket worn in The Talons Of Weng-Chiang!!! Miss Marple was entirely shot on 16mm film (just like the location filming for Doctor Who was in the 1970s) and the American DVDs I have aren’t the best transfer. But please take my word for what I see. This was the Christmas day episode in 1987, so post-dates its Doctor Who appearance by a full decade. 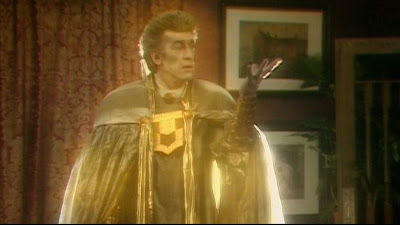 Amusingly it is being worn by Irish actor John Hallam, who two years later appeared in the Sylvester McCoy serial Ghost Light as the etherial alien Light (see below).